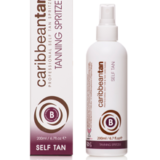 Caribbean tan sunless tanning wins almost every People’s Choice award every year. With a wide variety of application methods for different skin types, choose between an instant product if you want to be tanned immediately, or a gradual product if you can wait eight hours for the tan to develop fully. Decide on an A, B or C colour depending on your natural skin tone. No streaking, no dirty patches, quick drying and with anti-ageing benefits, this is the healthy and safe way to look your best.